Advanced Fantasy Baseball: Felix Doubront, the Next Red Sox Ace? 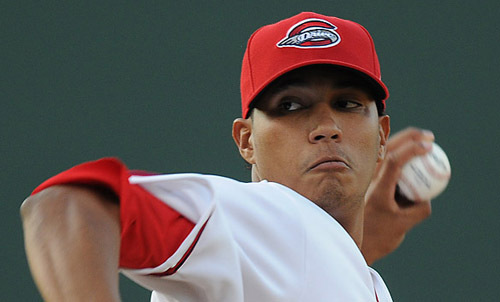 Felix Doubront has come on strong his last two seasons in the Red Sox organization. Doubront was signed out of Venezuela in 2004. He progressed slowly but steadily through the system putting up mostly good but not great numbers. The last two seasons things have started to click for him and he has emerged as a top prospect. Doubront is making his major league debut today primarily due to the DL-stints of Josh Beckett and Daisuke Matsuzaka. However, he also deserved the promotion because of his very good numbers at triple-A this season. He has a 2.11 ERA in 12 starts between Double-A and Triple-A this season, with 54 strikeouts, 22 walks and no homers allowed in 59 2/3 innings. He gets to face Manny Ramirez in his return to Fenway Park. Doubront utilizes a 91-94 mph fastball, a very good 79-81 mph changeup with screwball action, and a developing mid-70s curveball. Flawless and fluid downward pitching motion with excellent control. Deceptive delivery, hitters don't pick up the ball until late, causing his fastball to look a little faster. Used to struggle against left-handed batters, but seemed to fix this issue in 2009. He has a reserved and modest demeanor, but is aggressive and poised on the mound. Sometimes has the tendency to leave the ball up in the zone too much, giving up too many home runs. Athletic and agile in the field. Doubront struggled in 2007 due to numerous injuries, including recovery from a hernia operation. Doubront should be worth an add in AL-only leagues. He isn't likely to be great in mixed leagues just yet. He will probably go back to the minors when Dice-K comes off the disabled list. Watch the MLB Draft While You Work!